RPA9000 Rubber Process Analyzer is designed for measuring the viscoelastic properties of polymers and elastomeric compounds before, during and after cure. The acquired data gives exact information about the processability, cure characteristics, cure speed, and behavior of the compound at the after-cure. RPA9000 fulfills the complete range of all test requirements; Polymers, raw materials, basic, finished and cured compounds can all be characterized. Besides the cure properties, cure characteristics and processability can all be determined and evaluated. It is the state-of-the-art machine for dynamic testing purposes. 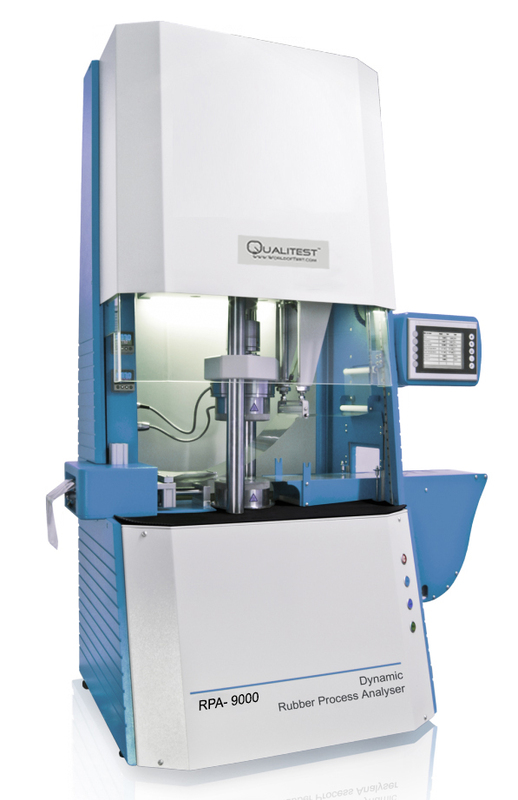 The machine can be fitted with several unique options such as variable die gap, low-temperature cooling, and high speed data acquisition – providing the highest frequency-strain combination available on the market. The high flexibility of the RPA9000 allows the user to program and execute arbitrary test sequences with the Analyses Software. Each dynamic test sequence can include an unlimited number of the following sub-steps: timed tests, isothermal tests, non-isothermal tests, amplitude sweeps, frequency sweeps, temperature sweeps, shear rate sweeps, relaxations, retardations, hysteresis and tension tests. Of course, any combination of these sub-tests are possible – with or without an initial strain, as well as strain or stress controlled. RPA9000 is entirely made of high-strength stainless steel, precision ground and hardened, significantly reducing sample slippage for highest dynamic test ranges and most accurate torque, modulus and viscosity readings. Machine with single test – multi subtest test procedure programming with up to 1000 sub-programs as well as an unbeaten shear rate range of up to 100 sec-1 – the RPA9000 is truly the most flexible and dynamic multi-function Rheometer in the market. For the best possible determination of all relevant test parameters the RPA-9000 is equipped with a large variety of test methods, test parameters as well as calculation and evaluation options. Instrument structure: friendly access to the electronics as well as the drive system of the instrument. Only highest quality products are used within the instrument. Drive system: Direct torque drive unit which has been specially developed for dynamic test purposes. Integrated into this drive system are ceramic bearings to reduce friction and significantly improve lifetime of the instrument. Due to this testing frequencies are possible up to 100Hz. User friendly operation interface, test programs can be easily generated and edited as well as whole test sequences can be generated within a few clicks. Data processing: All test results are calculated and evaluated online, as well as stored on the hard drive of the computer. The total testing time for one test is nearly unlimited.